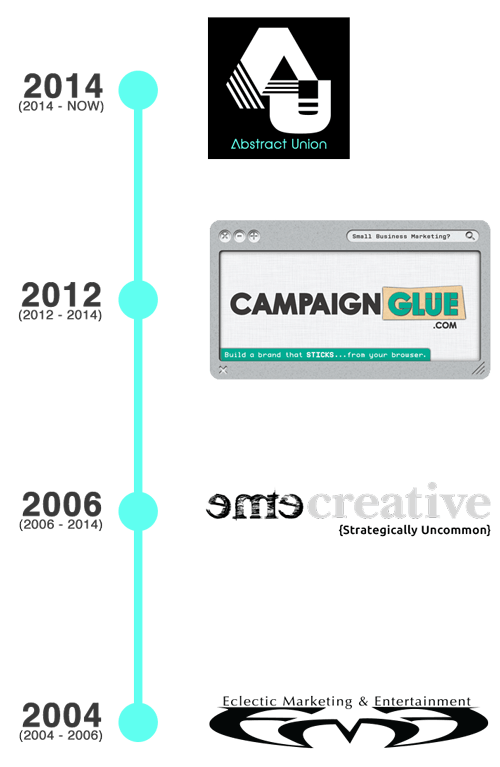 Abstract Union is a boutique marketing agency. // We're building multidisciplinary suites of services for client segments that bring people together. We help organizations bring people together. It's bigger than marketing communications. We're traveling a unique path. We plan to hire passionate people. We help people-oriented industries invite, inform, motivate, and inspire. Across abstracted disciplines: creative, entertainment, and publishing, we synthesize our skills and resources into online solutions, and assemble forward-thinking partners around our offerings. Abstract- expresses how we subtly grow concepts from being unrealistic, complicated, and indefinite to strategically uncommon solutions. Union- embraces partnership as a load-bearing pillar of what we build. And represents our support for assembly. Boutique- highlights the specialization of our core competence. Marketing- generalizes our knack for integrated engagement via event, content-centered digital, direct, and word-of-mouth touchpoints. Agency- vaguely categorizes our offering, and will never correctly classify the methods in which we plan to advance clients, partners, and employees. ... a key measurement of our success. ... thinking critically as well as creatively. ... leveraging diversity to build influence and broaden thought. … producing solutions and strategies that are both practical and unique. … generating thoughtful reductions to make things clearer or eminently more usable. … utilizing talents beyond the confines of commerce to positively impact tomorrow. … possessing enough intuition and insight to realize opportunities and people that typically get overlooked by others. … a continuous challenge that brings us to work every day. All the hard work is worth it when we’re blessed to make a difference, set new trends' and unite others to do the same. Pitching, executing, and managing non-traditional marketing strategies for bars in small college towns before social media, (as Eclectic Marketing and Entertainment) gave us our start, and proved to be ahead of the curve. But evolving into being a highly-specialized agency with creative, entertainment, and publishing components was our thing! Also, building ALL operations to have humanized online planning and billing was a more streamlined business model. Through it all, our abilities to make integrated marketing communication and event-based brand building more accessible and achievable remains constant. And we plan to deliver this in a multitude of different ways, building a “union” of partners to boot. But we’re still missing one thing... You. Come grow with us! Currently, we're tying up some loose ends. Check back here in a little bit! // Feel free to reach out.